The Huey crew like to spring surprises and, yet again, we have surprised our American friends! You may recall that back in January 2007 we invited 3 Vietnam veterans ( Fred Alvis , a crew-chief, Ron Paye, a Cobra pilot and Mark Jackson , the brother of Larry who was killed in Vietnam ) to come over to be reunited with Huey 509. The whole experience was filmed by the BBC and broadcast in February. 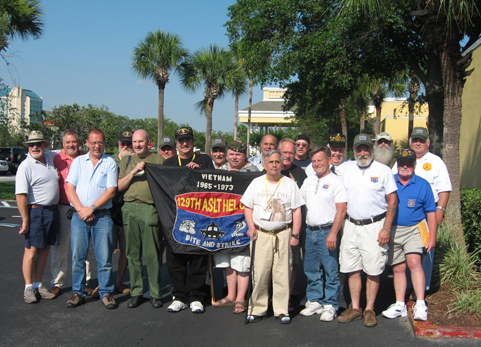 The men have all kept in touch with us since their return and told us they were planning on attending the Vietnam Helicopter Crew Members Association (VHCMA) Reunion . This is an annual event held in a different place each year in the US . This year it was to be held in Florida in June. They invited us to go over and join them, but the Huey had been booked to attend 2 Air Shows in Northern Ireland on the same weekend so we felt we had to say that we would be unable to attend. The 3 guys were keen to share their experience in the UK with their friends and fellow 129 th members and so asked us for a copy of the BBC programme. They wanted to play this short, 10 minute DVD and then answer questions about their trip. We were more than happy to send it but surprise number one was in store! Simon (who works for the BBC) had made a longer, more in-depth DVD and he arranged to have this copy sent instead! He sent the DVD to Alex Fernwalt , the President of the 129 th. None of the guys had seen this longer version! 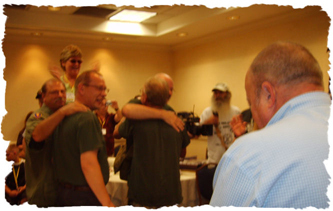 Two weeks before the Reunion, Neil Airey very kindly agreed to fly the Huey to Ireland which meant that Phil and Simon were now free to go to Florida ! They weren't allowed to go on their own though - Jo, Phil's wife and Nina, Simons wife didn't want to miss this trip! We didn't tell any of the 3 guys that we were going. We did contact Alex and told him of our plans but asked him to keep it secret. We wanted to surprise them all! finalise the surprise. It was agreed that the guys would show the DVD on Friday night and we would all be loitering ready to storm the room as soon as it was over! As we waited behind a closed door to their conference room we could hear the DVD being played and the audiences' response. It went down very well! We heard Ron Paye say that if only the Huey hadn't been flying in Northern Ireland , we would all have been there with them! We chose that point to gatecrash their party! The whole room erupted! Lots of laughter and a few tears too! They all made us feel very welcome. It was great to see them again and to meet so many other 129 th members and their families. Bill Wolf had been working hard compiling a book “Bite and Strike” a history of the 129th ,(click for more info) and had chosen this weekend to launch it. 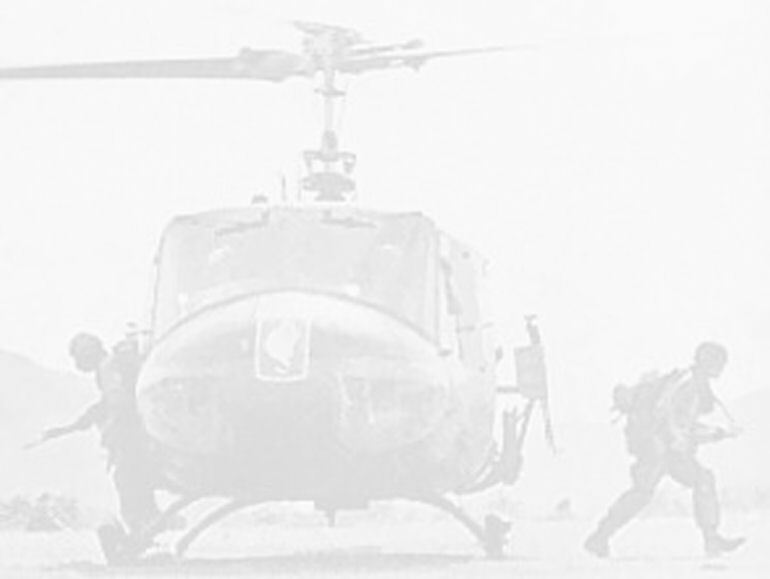 We were very touched to find that the last chapter is all about Huey 509 and our Huey Team. We were presented with a copy each and all the members at the meeting very kindly signed them for us. Again we were very touched when they asked us to sign their copies! The following day was spent back at the hotel where the reunion was held and we spent more time just chatting and listening to the members' stories. Jo and Nina were treated to a ride on a Harley! 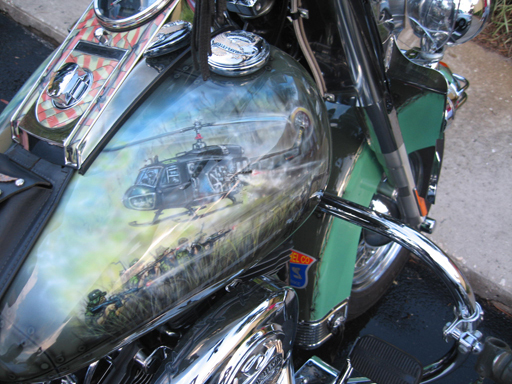 It is owned by Mark Jackson and has been beautifully painted to commemorate his brother and all those MIA or KIA. The members then sprung a surprise on us! 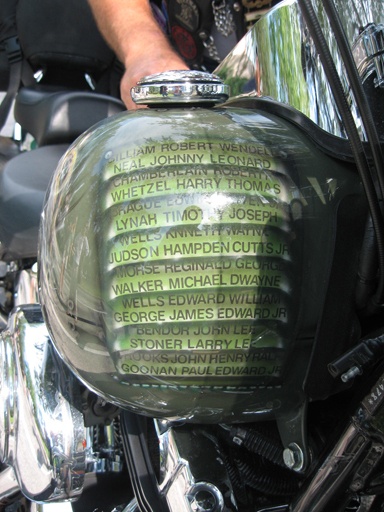 They made Simon and Phil life members of the 129 th AHC! They were truly humbled by this gesture. It is an honour. The day ended in style with a huge dinner dance attended by all the members of the VHCMA. We hadn't bought tickets but 4 tickets were magically found! It was a great night, full of stories and laughter. We met some wonderful people and were all made to feel really welcome. A massive thanks to everyone who was there! Their only regret was that we hadn't taken the Huey with us!!! They don't ask for much do they?!! !